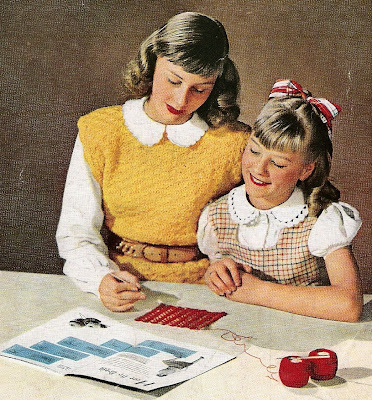 I love so many things from the 1950's, sometimes I think I was born after my time! I am amazed at some of the clever products that were available in those days, to make crocheting easier. I wish some of them were still available today. Many times I have felt like the woman in the cartoon above, especially when I get interrupted while winding a ball. 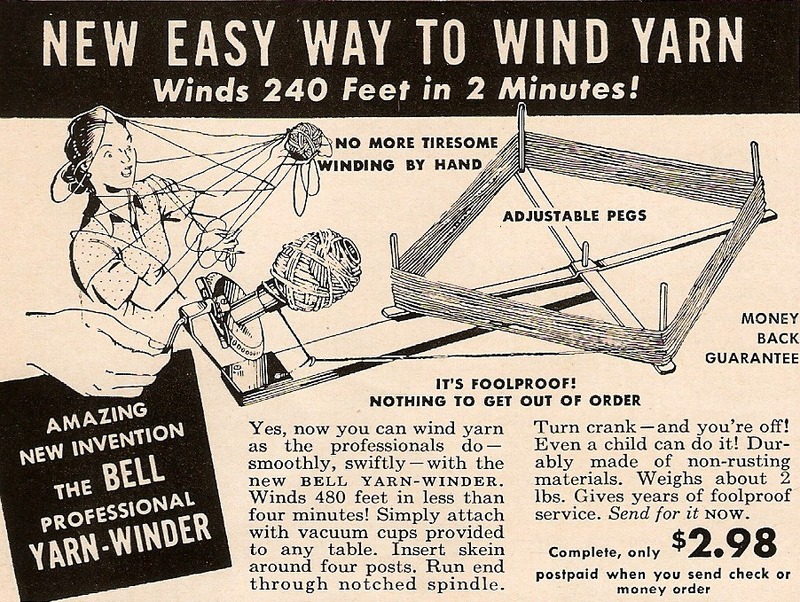 What a wonderful invention, a ball winder and swift combined! Continuing with the two in one theme, how ingenious to make this ball holder double as a crochet hook case, that suctions onto any smooth surface. I am trying to imagine myself "at the park" looking for a place to suction it to. The "perfect bridge prize" indeed! Some of the print in vintage pattern books can be very small. This line marker must have been very helpful! What a deal, a deluxe hook for only 15 cents! For 20 cents they would send you 2 pattern books to go with it! I wonder how well it worked, since they don't sell hooks with this clip feature any more. Nice concept though. 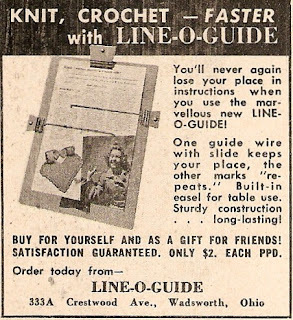 I think I would have been quite happy crocheting the day away with these handy gadgets, but I do feel lucky to live in the age of Chibis, Etimos and Ravelry! 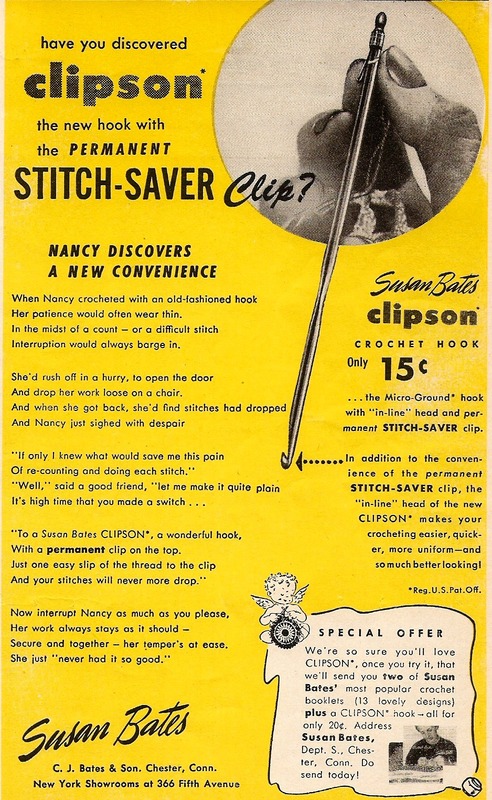 I was born in 1950 but didn't start crocheting until the mid 60s, so I missed these handy gadgets. But the ad copy does bring back memories. 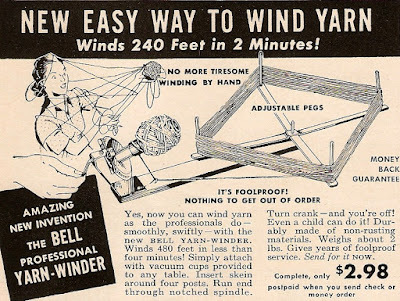 I really like the swift/ball winder combo. Thanks for walk down memory lane! Make a Child's Version of the Echelon Hat!